If you're girl is looking to become the newest member of the Justice League, then she'd better have a crime fighting outfit to wear! 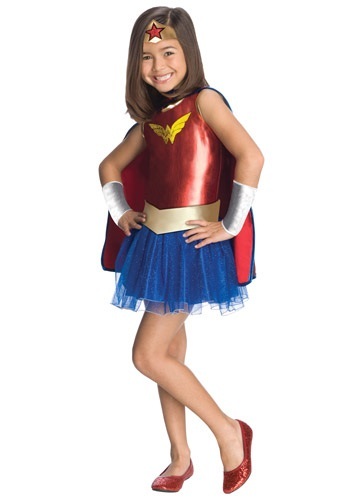 Based on the classic DC superhero, this kids Wonder Woman costume reimagines the costume in tutu costume for your little girl. It has her signature emblem on the front along with the heroic red, blue and gold colors from the comic books. The whole look is enough to make your little girl feel tough heroic enough to block some energy blasts with her gauntlets. Just make sure you begin training her in the ancient Amazonian arts of combat before you send her off to fight any super villains!